Terry Gilliam is known more for concocting his own fantasy worlds than for shooting on location, but when he signed on to make a movie in New York City, he didn’t do it half-heartedly. 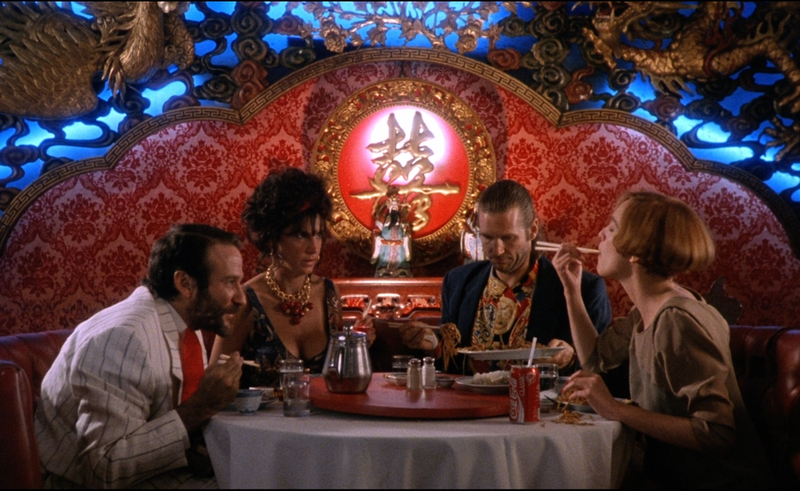 The Fisher King is one of the great New York films because Gilliam shot his version of the city: crowded and chaotic, but also dotted with majestic towers, ancient castles, and an enchanted wilderness. Through forced perspectives, lighting, and color, Gilliam and his crew built a multi-tiered New York, where the rich live in spare, gray boxes high in the air, while the working class jostle among the colorful clutter and hazy lights at street level. And then there’s the entire culture below the street, where broken men and women live in basements and under bridges. Richard LaGravenese’s Fisher King script was the first that Gilliam didn’t help write before directing, but the director found a way to incorporate it into his aesthetic, same as he did with New York. The plot follows an arrogant radio shock-jock who inadvertently inspires a deranged listener to open fire on diners at an upscale Manhattan restaurant, and then overcomes his crippling guilt when he meets a cheerily delusional vagrant whose wife was killed by that shooter. Pitched wrong, this all could’ve come out too cute, or embarrassingly tone-deaf about mental illness and homelessness. Instead, Gilliam exaggerated the romanticism, the grotesquerie, and the personal pain that runs through LaGravenese’s story, creating a reality where The Fisher King’s more preposterous turns make sense. Gilliam pulled this off with two unlikely leads. Little in Hollywood golden boy Jeff Bridges’ earlier work suggested he was a good fit for the role of callous DJ Jack Lucas. (According to Bridges, he tried to convince Gilliam to hire somebody else when they first met.) But the actor figured out how to shade his usual cool, laid-back screen persona into something more like self-centered disengagement. For the part of Parry, Jack’s homeless savior, the studio wanted Robin Williams, who’d worked with Gilliam before on The Adventures Of Baron Munchausen. Up to that point in his career, Williams tended to fluctuate between flat-out zany and super-serious—sometimes even in the same movie, as in Good Morning Vietnam and Dead Poets Society. Gilliam found the seriousness within the zaniness, letting Williams cut loose without forgetting that his Parry was supposed to be deeply damaged. Meanwhile, here at the start of his screenwriting career, LaGravenese was already establishing himself as someone who writes strong parts for women. Jack’s journey to redemption is facilitated in part by his girlfriend Anne, a no-nonsense video-store owner played by Mercedes Ruehl, who won an Oscar for her portrayal of someone tired of waiting patiently at home while her man gets his act together. And Amanda Plummer matched Williams’ broadness with her own quirky performance as Lydia, a lonely publishing industry accountant who catches Parry’s eye. A lot of what The Fisher King is about is carried as much by Anne and Lydia—each hardened in her own way by life in the big city—as it is by the movie’s two main men. Some parts of The Fisher King are very much of their time, such as the video store, the repeated use of the Snap! dance hit “The Power,” the derision toward yuppies, and the focus on the homeless. (While too many sick and indigent people still live on the streets in cities like New York, their plight isn’t the hot “cause” that it was in the late 1980s and early 1990s.) And though Gilliam was working extra-hard to restrain his more grandiose tendencies in the wake of the financial debacle of his Munchausen, this film still feels both overextended and overstuffed. On the other hand, a leaner Fisher King might’ve lost the moments that make the movie special, like the drunken conversation between Anne and Lydia, Michael Jeter’s drag queen character belting out Sondheim in a Manhattan office, the spontaneous waltz in Grand Central Terminal (a Gilliam invention), and Parry having long, disturbing nightmares about a “red knight” who resembles his wife’s exploded head. Besides, The Fisher King’s occasional ungainliness and digressiveness works with LaGravenese’s theme of avoidance. Jack is a man who doesn’t want any part of Parry’s quixotic quest—which includes a search for The Holy Grail—because he’d rather do as little as he must to get back to his regular life. Gilliam’s great gift to this movie was to see how LaGravenese’s story about selfishness and modern alienation fit perfectly in a city whose residents try their best to look straight ahead, willing to miss the wonders all around if it means not seeing something that makes them uncomfortable. For years, fans of Criterion’s old laserdisc of The Fisher King have petitioned for its bonus features to be carried over to DVD and/or Blu-ray. The new Criterion edition finally obliges, bringing back the laserdisc’s 10 minutes or so of deleted scenes, along with Gilliam’s informative, conversational commentary track. In the latter, Gilliam explains a lot about how he worked in close collaboration with the cast and with LaGravenese—who was on-set the whole time—to deliver something that satisfied both the studio and his muse, and he describes the whole process as so enjoyable that he’d like to try it again. (Which he did… his next film would be the even more successful 12 Monkeys.) Criterion also adds nearly two hours of new supplemental material, including a 2005 Williams interview, two short pieces where Bridges goes deeper into his work on the movie, and a lengthy documentary featuring interviews with all the major surviving principals—including producer Lynda Obst, whose anecdotes are so revealing that they’ll make any movie buff pine for a feature-length doc about the rise of women in Hollywood in the 1980s.